North Korea’s state-controlled media appear to have begun a purge of high-ranking Chinese officials from their records, in a sign that relations between the two communist countries are at an all-time low. The South Korean newspaper Chosun Ilbo reports that, in a television special Saturday night, archival footage of dictator Kim Jong-un appeared to have been doctored to remove Liu Yunshan, a senior Chinese Communist Party member who became the first Chinese official of his rank to visit North Korea since the demise of Kim’s predecessor and father, Kim Jong-il. The photo that had previously included Liu was run in a series showcasing political highlights for North Korea in 2015. Liu’s visit to North Korea was once considered such a highlight, though he is now notably absent from the footage. “A film editor here has examined the film and says Liu seems to have been edited out completely,” the Chosun Ilbo adds. 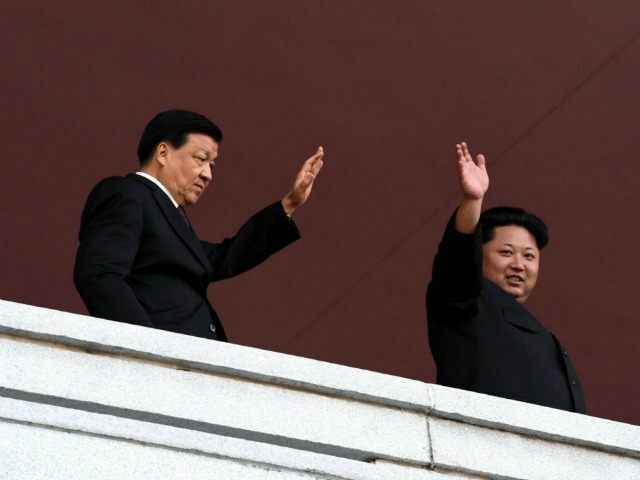 Photos released by the North Korean government in October show Kim not only appearing with Liu, but seemingly relishing his presence before North Korean crowds. North Korea’s claim that it detonated a hydrogen bomb last week appears to have dramatically altered the relations between the two countries. As communist allies, China has become a pivotal source of trade for North Korea, and their ties have frustrated most of the world’s efforts to sanction North Korea and curb its rogue behavior, including well-documented cases of human rights abuse. Following the blast – which many scientists have noted does not appear to have been a hydrogen bomb, but a different sort of atomic bomb – China summoned its North Korean ambassador to protest and issued a stern statement of condemnation. “We strongly urge the North Korean side to remain committed to its commitment of denuclearization and stop taking any actions that will make the situation worse,” Chinese Foreign Ministry spokeswoman Hua Chunying said shortly after the news broke. South Korean news agency Yonhap anonymously quotes a number of Chinese officials as saying they felt “extremely embarrassed” by the bomb “because nobody expected the nuclear test to take place.” The article cites Liu Yunshan’s visit to North Korea as one of a number of reasons Chinese officials believed the North Korean government would inform them of any such event. “We have been so naive in trying to anticipate what will happen in North Korea,” another source told Yonhap. Chinese state-controlled media have taken to condemning the nuclear blast, while calling for multilateral talks, definitely including South Korea, but potentially also including Japan and the United States. South Korea has already sent its foreign minister to China to discuss a response to North Korea’s bomb. Chinese officials have, of course, framed their language in such a way to also condemn the United States for preparing to take action against North Korea. “Peace and stability in East Asia serve the fundamental interests of all parties. China hopes all sides show restraint and act prudently to avoid any escalation of tension,” Foreign Ministry spokesperson Hong Lei said Monday. Hong, nonetheless, reiterated that China “firmly opposes” North Korea’s nuclear test.